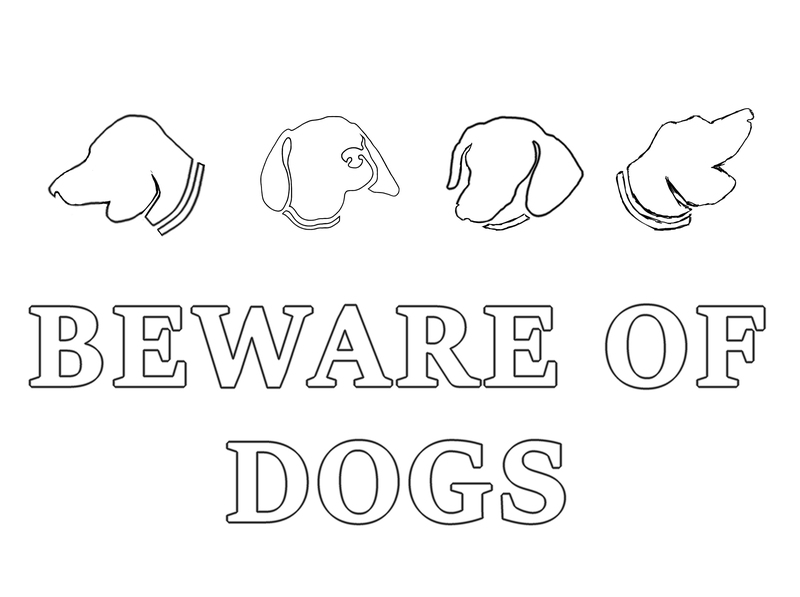 Like this “BEWARE OF DOGS” project. A customer asked if I could make a sign out of metal to keep people from wandering on her property. She has four dogs. She asked if I could make a sign with silhouettes of all her dogs with Beware of Dogs in the middle. I initially asked my daughter (my digital artist-in-chief) to make a mock up of the sign and figure out how long it would take her to draw it all out. It took her much longer than we initially thought since one or two of the dogs barely showed their faces in any of the photos. But she got it done, and this was the final sketch she presented me with. The idea was to cut out on a CNC machine (a computer controlled cutting machine) from the digital rendition. I brought the mock up and estimate back to the customer and this is when we realized that getting this done by computer, off island would end up being too costly. We had to rethink the sign all over again. I decided to offer to cut out one dog silhouette and write the words on the silhouette. To achieve this, I asked my daughter to draw a dachshund silhouette from the pictures of the customer’s dogs. I then printed this on a white piece of paper. I then transferred the silhouette onto a piece of steel using a grid pattern. Then came the fun part: I cut the shape out with my brand new cutting torch! I hadn’t cut anything that intricate with a torch since Art School and it proved to be quite a challenge, but an enjoyable one nonetheless. Verdict: I have steadier hand and I am much more confident with the torch than I was 30 years ago….Which means that there was minimal grinding to do. I then made a stand to hold the sign up at eye level when you drive into the driveway. Now, all that is left to do is wait for the paint to fully dry* before sticking on some heavy duty reflective words. The journey was long and full of roadblocks, but I like the result a lot and I hope the customer does as well. *spray paint cans usually say that the paint will be fully dry in 24 hours but it’s been raining every day for the last forever, so I have been letting my projects sit for as long as possible in this wet, cold, damp West Coast. I also never believe paint drying times. Maybe I would if I live in the hot desert.